Microsoft has launched a new and improved Xbox Wireless Adapter for Windows 10. The biggest change is that it's far sleeker than the previous model. It's 66 per cent, or two thirds, smaller than the original which makes it less obtrusive and less likely to get in the way of other USB connected dongles and devices. In related news Microsoft has also just released a trio of new Xbox Wireless Controllers sporting new colour schemes and textures. The compact new Xbox Wireless Adapter for Windows 10 offers wireless stereo sound support and the ability to connect up to eight controllers at once. Microsoft's new adapter stick comes with a translucent cap, plus an indicator light which lets you know when it is pairing and subsequently operational. According to the US Xbox site, the new Xbox Wireless Adapter for Windows 10 is released on 8th August. It's priced at $24.99 and will be available bundled with an Xbox Wireless Controller for $79.99. 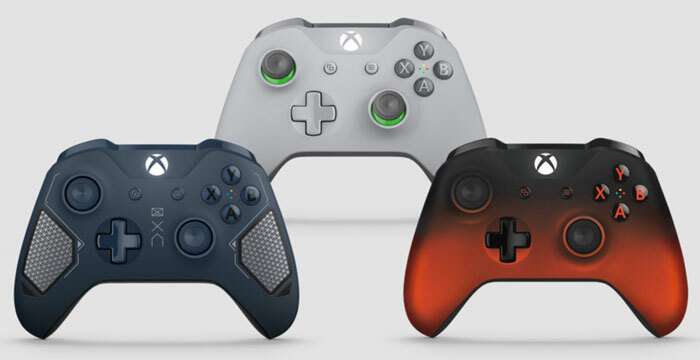 Microsoft's latest Xbox Wireless Controller designs are a Green/Grey controller, the Patrol Tech Special Edition (above left), and Volcano Shadow Special Edition (above right). The Grey/Green design is the cheapest at $64.99 and it will be available from 3rd August. The other two controllers have a price of $69.99 reflecting heavier customisation, like various glossy, textured, rubberised areas around the controllers and buttons. If you are interested in the Volcano Shadow Special Edition, it also ships from 3rd August. However, the Patrol Tech Special Edition controller won't be available until 5th September. Why was it sooo bulky in the first place? My understanding is that it was to make sure the circuitry and the antenna was enough to offer a reliable connection in various operating conditions. As someone who bought ‘nano’ WiFi dongles and a game controller with a ‘nano’ reciever (think those little 5mm black nubs that stick out of your USB port), I can see why. I had to buy USB extension cables to bring the receivers forward in order to stop the connection dropping mid game. The receiver seems like a nice improvement at a decent price just as long as the reduced size doesn't compromise the connection reliability with the controller. I bought an XBox controller with Bluetooth to use directly without a dongle. Would this be better? Might it work with “compatible” XBox controllers?